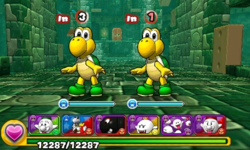 World 1- Tower is the sixth course of World 1 in Puzzle & Dragons: Super Mario Bros. Edition. 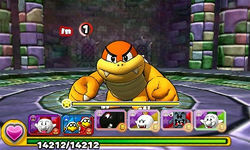 It is a basic, tower level with enemies consisting of Goombas and Koopa Troopas and a boss fight with Boom Boom. When the player enters this course for the first time, the game provides a reminder that additional colored Orbs will come into play. Clearing this course once unlocks Super Mario and Super Luigi as Leaders and the Transformation spot at Toad Houses. This level is straightforward, consisting of four battles and Boom Boom for the boss fight. When playing this course for the first time, Boom Boom drops a Star Coin upon defeat. The player has Fire, Water, Wood, Light and Heart Orbs on the Orb field. A boss battle with Boom Boom. When playing this course for the first time, the XP rewarded to the player when defeating Boom Boom is 1292, while subsequent visits reward the player with 1003. ★World 1- Tower is a difficult version of World 1- Tower from ★World 1, with Dark Orbs enabled on the Orb field. This page was last edited on June 24, 2018, at 12:26.